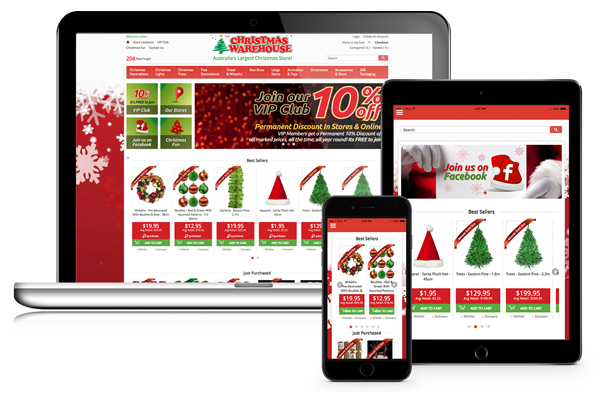 We developed the Christmas Warehouse online shop in time for the 2008 Christmas season. It has since become the premier online Christmas Shop. Our approach was to focus the site on the products and strong SEO. The site was designed by starting with the SEO requirement and working up, until the final graphic design was integrated. This ensured that the functionality and ranking of the site was not compromised by the initial graphic design. Each product and category has been arranged to produce the most optimal SEO results. *Update: The site was completely rewritten and updated in 2011 using the CMS provided by WebLife .. the results have been excellent in terms of both rankings.